SC connector was developed by the laboratories at Nippon Telegraph and Telephone (NTT) in 1980s, hitting the market strongly after the advent of ceramic ferrules as the first connector. SC stands for “square connector” or “subscriber connector”, which is a push-on, pull-off connector with a locking tab. It has a push-pull coupling end face with a spring loaded ceramic ferrule by which SC connector can provide for accurate alignment. Commonly, it can be used with singlemode and multimode fiber optic cables with low cost, simplicity, and durability. Due to its excellent performance, it dominated fiber optics for over a decade and still plays an important part now. The picture below has given a visualized description of the most common elements in SC connector. It is mainly made up of the fiber ferrule, connector sub-assembly body, connector housing, fiber cable and stress relief boot. The fiber ferrule – In the heart of SC connector, there is a long cylindrical 2.5mm diameter ferrule which is made of ceramic or metal. The ferrule has a hole about 124~127um diameter in its center, so that the stripped bare fiber can be inserted through it. The end of the fiber is at the end of the ferrule, where it typically is polished smooth. The connector sub-assembly body – The ferrule is then assembled in the SC sub-assembly body. The end of the ferrule protrudes out of the sub-assembly body to mate with another SC connector inside a mating sleeve (also called adapter or coupler). The connector housing – Connector sub-assembly body is then assembled together with the connector housing. Connector housing provides the mechanism for snapping into a mating sleeve (adapter) and hold the connector in place. 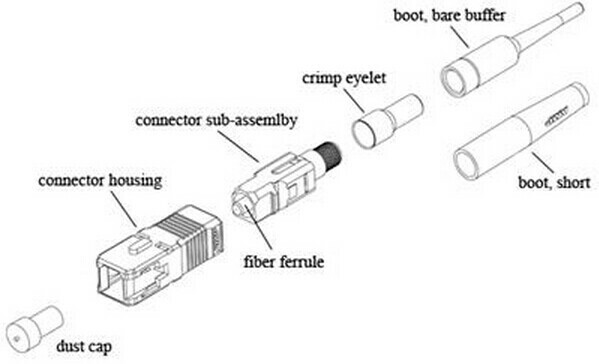 The fiber cable – Fiber cables are often crimped onto the connector sub-assembly body with a crimp eyelet. This provides the strength for mechanical handing of the connector without putting stress on the fiber itself. The stress relief boot – Stress relief boot covers the joint between connector body and fiber cable, and protects fiber cable from mechanical damage. According to the polish style, SC connector can be divided into PC (Physical Contact) style, UPC (Ultra Physical Contact) style and APC (Angled Physical Contact) style. SC PC connector is polished with a slight spherical (cone) design to reduce the overall size of the end-face. But now, the most common types are UPC type and APC type. SC UPC connector – It is an improvement from SC PC connector, resulting in a lower back reflection (ORL) than a standard PC connector, and allowing more reliable signals in digital TV, telephony and data systems. It is available in single-mode and multimode. You can tell them apart from the color: SMF UPC connector is blue, while MMF UPC connector is beige. SC APC connector – It is angled at an industry-standard eight degrees. As a result, any light that is redirected back towards the source is actually reflected out into the fiber cladding, again by virtue of the 8° angled end-face. That is why its back reflection is the lowest among the three types. APC connector is only available in single-mode, and the color of it is green. According to the application, SC connector includes SC BTW connector and SC jumper connector. SC BTW Connectors – BTW is the abbreviation of “behind the wall”. As the name implies, can be used to connect the adapter panel, and then terminate Outside Plant (OSP) cables as well as building cables. SC BTW connectors are designed for 900 micron buffered fiber. This product is intended to meet Telcordia GR-326-CORE, Issue 3 for Type II Media (900 micron buffered fiber). SC Jumper Connectors – Generally, SC jumper connectors are designed on the end of fiber patch cables, and then connect GBIC modules in Central Office (CO), Local Area Networks (LANs), device terminations, etc. Robust family of connectors designed to mount on 1.6 – 3.0 mm fiber cordage and intended to meet the Telcordia GR-326-CORE, Issue 3, for Type I Media (reinforced jumper cordage). The common types are 2mm Jumper connector and 3mm Jumper connector. Generally, when compared with other connectors, SC connector is more rugged and adaptable. What is more, it is capable of tunable and stable performance. With these significantly features, SC connector can be applied in many fields, such as telecommunication, CATV, broadband and so on. The products of SC connector are also various, such as SC adapters, SC terminators, SC converters and SC jumpers. Fiberstore as the main professional fiber optic products manufacturer in china offers a various kinds of fiber cable connectors, including SC Connectors. What is more, the products with these connectors are also full in store, such as SC fiber cable, with good quality and low price. This entry was posted in Fiber Optic Connectors and tagged SC APC connector, SC connector, SC Jumper connector, SC UPC connector on September 25, 2015 by Admin.